Mark Werner is an attorney licensed to practice law in the State of Kansas, and before the U. S. District Court for the District of Kansas, as well as the 10th U.S. Circuit Court of Appeals. Mark graduated from Kansas State University with a Bachelor of Science degree in 1979, and from the University of Kansas School of Law in 1982 with a Juris Doctor degree. Mark moved to Pittsburg in 1982, where he started his law practice, specializing in estate planning, business and commercial law, employment law, and insurance defense litigation, as well as a general civil and criminal practice. 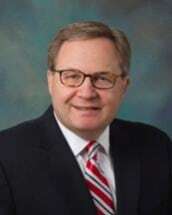 In 1995, Mark joined City National Bank of Pittsburg (now Commerce Bank) as Vice President and Trust Officer and served as legal counsel to the Bank, and in 1999 took on the responsibilities of Vice President of Commercial Lending. In 2004, Mark was named the Pittsburg Market President of Citizens Bank, N. A Throughout his time in banking, Mark continued his private law practice part-time in the areas of estate planning and commercial law. In 2011, Mark returned to the full-time practice of law, opening his own law firm. He practices in the areas of estate planning, commercial law and litigation, business formation and planning, real estate, and general trial practice. He also advises clients on business finance matters and local government relations. In addition to his professional duties, Mark has served as the Mayor of Pittsburg twice, while serving 10 years on the Pittsburg City Commission. He has been a part-time instructor in law-related topics at Pittsburg State University, and has served on a number of community and philanthropic boards and fundraising efforts. Mark is a graduate of Leadership Pittsburg and Leadership Kansas. He is also past president of the Crawford County Bar Association and the Southeast Kansas Bar Association. Identity Theft and the Law”, Crawford Co. Bar Association CLE presentation, January 2012. Planning for the Unexpected” Estate Planning Seminars, Pittsburg State University Human Resource Services Programs, Summer & Fall 2012.